"To give your USB devices the power they crave without hogging the outlets that other gadget-obsessed folks crave, the Flipit! has a small power tab that flips out and goes over an AC outlet. When you plug in another device over it, the Flipit! borrows some of that power to charge your USB devices." Here is an effective gadget that may get you out of a tough situation when you cannot find an available power source for charging your USB device. The idea is simple: share an outlet with another device. Flipit! is inserted between the wall outlet and the power cord prongs. 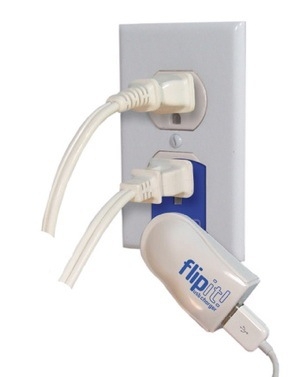 Your USB device plugs into the Flipit! and can then be charged by sharing the power source. For comparison purposes, Belkin has a similar product that you might also consider. These are definitely handy tools to have at your disposal at work or while traveling. Nifty, but awfully pricy for something that only charges one USB device.